In Kenya and the northern part of Tanzania, there live a semi-nomadic group of people called the Maasai. Because this ethnic group lives in close proximity to the game parks of Kenya, they are one of the more known tribes in Africa. As an ethnic group, the Maasai are made up of different sections such as the Isiria, Ilarusa, Kore, Isikirari and Parakuyu. The majority of the Maasai people live in Kenya. In a 2007 census, the population of the Maasai was said to be at approximately 650,000 in Kenya and 646,000 in Tanzania. In Kenya, the 2009 census places the population of the Maasai at 840,000. Although there have been invitations and even programs encouraging the Maasai people to give up their semi-nomadic way of life, some members of the tribe continue to live according to the customs of their ancestors. They are a proud ethnic group with distinct customs and traditions. They speak the Maasai or Maa language, which is also spoken by other tribes in East Africa. 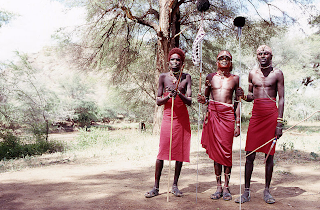 Some members of the Maasai tribe also speak Swahili and English. Getting to know more about the Maasai customs, traditions and way of life is important because, just like the other cultures sharing this place called Earth, the Maasai are part of the rich history of this planet. Maasai warriors have always been known to be one of the bravest and fiercest warriors from Africa. Each warrior has to undergo different rites of passage before he can truly be embraced as a Maasai warrior. Maasai warriors start out as a group of young boys who undergo emuratta or emorata. This is a Maa word that means circumcision. The process is painful, especially since it is done without the benefit of anesthesia. Silence from the warrior-hopefuls is necessary and no expression of pain is acceptable. The procedure is both delicate and tedious so utmost care is taken. It takes between 3 and 4 months for wounds to heal. Black clothing is the prescribed dress for the would-be warriors. This color of clothing is worn for 4 to 8 months. Other rites of passage follow until the junior warriors come of age through the eunoto ceremony. The eunoto ceremony may last for 10 days, sometimes even more. There is singing and dancing on top of practicing certain rituals. The warriors perform a form of jumping dance during the eunoto. Girlfriends of the junior warriors wear eye-catching costumes and parade themselves during the ceremony. The warriors' mothers pay tribute to their sons' courage through song and dance. The Maasai warriors are protectors of their cattle, their lands and of their people. They go on walkabouts and guard their territories. In the past, Maasai warriors took cattle from other tribes because they believed that their god Enkai bestowed cattle specifically to their race. Now, the Maasai people have learned to barter and trade in order to improve their basic cattle stock. Killing a lion is a status symbol within the communities of the Maasai. Lion hunting among the Maasai warriors is not done just for the fun of it. There are rules that regulate this brave and dangerous activity. Today, hunting lions is banned in parts of Africa. However, there are still instances of lion killing usually by young warriors who hunt the lions that maul their livestock. Theirs is a patriarchal society. 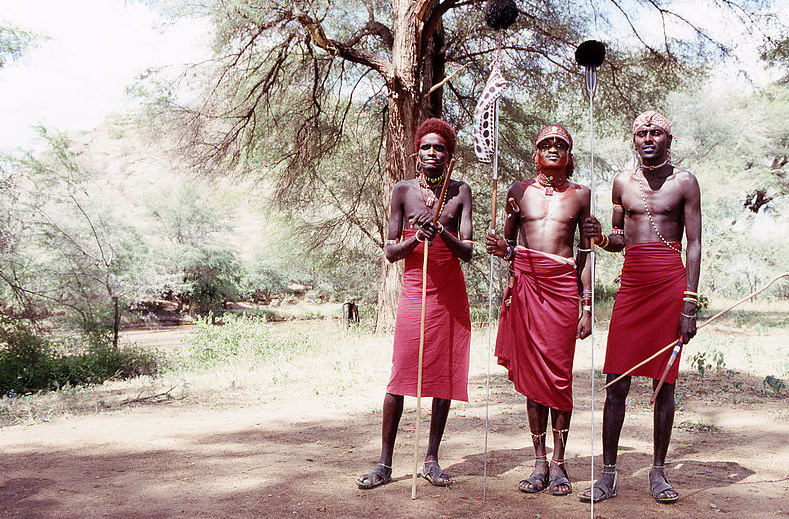 A group of Maasai elders serve as decision makers for the whole tribe. Maasai laws are oral laws passed down from generation to generation. The Maasai people practice monotheism. Enkai or Engai is their one god. He can either be a benevolent god whom they call Engai Narok or Black God, or he can be a vengeful god called Engai Nanyokie or Red God. In recent years, some of the Maasai people have embraced Christianity and Islam. Those who cling to traditional practices do not bury their dead. Instead, corpses are left for scavengers, like the spotted hyenas, to feast on. In the past, the Maasai gave only the great chiefs proper burial. Cattle for them is currency. It gives one power. A Maasai man is considered wealthy if he owns a good number of cattle and has many children. Having many cattle but few children does not make a Maasai man rich. Maasai traditional dress consists of a colorful cloth (usually red) called the shuka, simple sandals made of cowhide and Maasai jewelry. The men carry wooden clubs called an orinka. From animal-skin clothing, the Maasai have shifted to cotton cloth. Red is the favorite color for clothing but they also wear other colors like blue and black. The Maasai also wear cloths with African designs, stripes and checkered patterns. Even the sandals they wear are not all made with 100% cowhide anymore. Some sandal soles are made with plastic or rubber tire strips. Both men and women wear Maasai jewelry. Wooden bracelets are common. 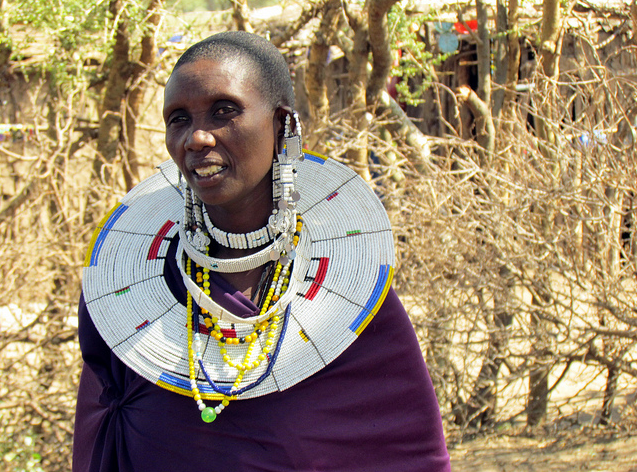 The colors of the beaded jewelry worn by a Maasai have meanings. White is for peace, blue is for water and red stands for bravery. Stretched earlobes are a common feature of Maasai. They use different materials to pierce as well as stretch their earlobes. These include thorns, twigs, stones, and even elephant tusks. Women wear beaded ornaments in their earlobes. Maasai houses are made from a mix of materials readily available in their land. These materials include timber poles and wooden branches. The wooden poles and branches are held together with a mixture of mud, grass, sticks, ash, human urine and dung. Meat, milk and cattle blood used to form part of a Maasai's diet. Today, their diet consists of cow's milk, a maize-based meal, beans, butter or fats for cooking and porridge. The Maasai depends on cultivated food like potatoes, rice, maize and cabbage. Meat is still part of their diet but cattle blood is not commonly taken anymore. This may be due to the fact that the cattle population under the care of the Maasai has dwindled extensively. Modern Maasai men and women are now engaged in farming, selling of various products including milk, milk products, minerals, jewelry and embroideries, or running stores and restaurants. Some are wage earners working as tourist guides, security guards and waiters. Others have taken employment in government offices and in the private sector and some NGOs. The Maasai people practice polygamy as well as form of polyandry (women having multiple husbands or mates). Rites of passage are common in the Maasai culture. These are rites of passage that they need to go through according to their custom. Some of their ceremonies include the Maasai senior boy ceremony (enkipaata), the Maasai circumcision (emuratta), the Maasai marriage (enkiama), the Maasai warrior-shaving ceremony (eunoto), the Maasai milk-drinking ceremony (Eokoto e-kule), and the Maasai meat-eating ceremony (enkang oo-nkiri). The Maasai people are pastoralists. This Sub-Saharan African people raise livestock, specifically cattle. They move their herd across vast tracts of land where fresh pasture and water sources can be found. Unfortunately, amount of land accessible to the Maasai has been greatly reduced. Maasai lands were taken away first by the British in the early 1900s and subsequently by the governments of Kenya and Tanzania for the development of game reserves and other purposes. The governments of these two African nations have set up programs that aim to persuade the Maasai people to abandon the semi-nomadic ways of their people. Although a number of Maasai are now living a more sedentary lifestyle and working as crafts people, farmers, guides, etc., there are still those who have stayed true to their traditions. They continue to assert their rights to the lands that now are part of different national parks in Kenya and Tanzania. Through the help of enterprising individuals and groups, one can live the life of a Maasai, although not completely of course. A number of Maasai tribes both in Kenya and Tanzania allow outsiders to visit their villages for a meet and greet and introduction to Maasai culture and lifestyle. Maasai warrior training is a vacation experience offered by several organizations. Groups are taken into northern Kenya's bush country where participants are given first hand experience of what it is like to live as a Maasai. Participants wear red Maasai garb, carry spears and shields and go through some of the activities Maasai warriors go through themselves. Of course the experience is not exactly authentic as participants stay in luxury tents with access to catered food, and clean water. The Maasai people are not given much choice these days. Many can no longer afford to live according to their traditional customs and lifestyle. Once upon a time, they practiced communal land management and moved their herd according to the changing of the seasons. This is not exactly the case anymore for most of the Maasai. The lifestyle of the Maasai, and of other African tribes, is very different from most people in the world today. People of other cultures can learn from them, especially how to live a simpler life and how to use (not abuse) the resources available to them. A number of concerned groups continue to help the Maasai preserve and protect their culture, traditions, lifestyle and their dignity. But their efforts are not enough given the ever-changing demands of globalization and modernization. Finding out more about the Maasai and other ethnic groups in Africa and the rest of the world is the first step in helping these ethnic groups preserve their culture and identity. If there is one thing you have to keep in mind about the Maasai, it is that their ethnic group name is spelled as "M-a-a-s-a-i" and not "M-a-s-a-i." Although the later has gained some level of acceptance, the true Maasai prefers the original spelling. If you want your translated documents to contain the proper spelling and grammar, make sure to have the translations done only by Day Translations and Your Spanish Translation. In case of interpretation work, their sister company, World Interpreting, Inc. can provide you with flawless interpretation services. Drop them a line anytime of the day. They will be happy to receive your questions and inquiries. He that has never traveled thinks that his mother is the only good cook in the world.